UPDATE 5/20/16: My Gumroad shop is now closed. The remastered digital book version of Charlie & Clow is now available only for Patreon patrons. To find out more, click to go to my Patreon page. There are some exciting things coming soon, but first let’s talk about what’s happening now. 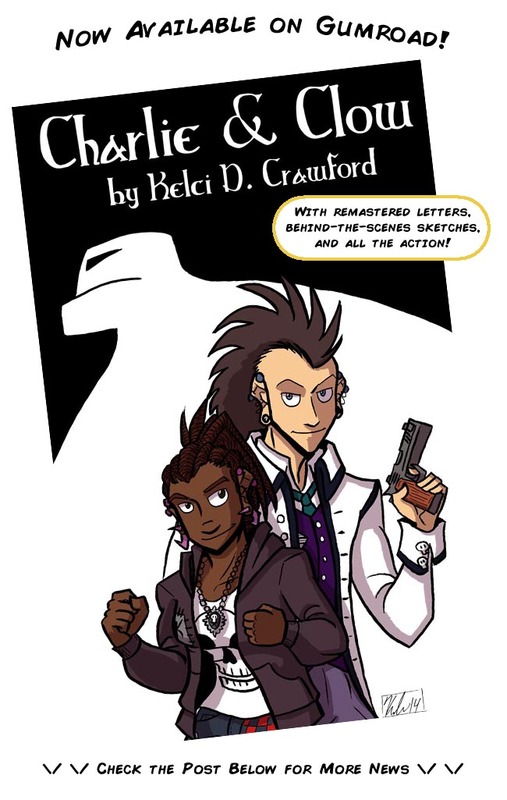 Charlie & Clow now have a digital book release! This new book features remastered lettering and behind-the-scenes sketches. But that’s not the only thing. They also have another book coming out TOMORROW, called Charlie & Clow: The Bonus Arc. I’m currently making some final touches, but it will appear on Gumroad tomorrow, October 8th. But that’s not the only thing! This badass duo will also be getting their own book IN PRINT. The plan is to get it printed before Thanksgiving this year. Everything’s prepared. I have to talk to the printer about getting it done. …BUT THAT’S NOT THE ONLY THING! Charlie & Clow: The Case of the Wendigo. The script for this is finished. I’ll be making the art for it starting January. Well, comics-making is only a part-time gig for me at the moment. I still have to work at a day job, and I’m currently updating two other webcomics, Validation and Seeing Him. Johnson & Sir is finished and currently on KickStarter for funding their new book. The fact that I plan on making The Case of the Wendigo is amazing to me at all! Part of the reason I’m waiting until January to start making the pages is so I can make the edits I need to for the script and finish up other projects until then. When I DO finally get to make the comic, you’ll find out about it here on this site first. Until then, come back tomorrow for Charlie & Clow: The Bonus Arc, and stay tuned for further updates! No, you’re awesome! Looking forward to all the Charlie & Clow happenings.